Syrian representatives of Assad and opposition figures end two-day talks without concrete result. Syrian representatives of President Bashar Al-Assad's regime and opposition figures ended a two-day round of talks in Moscow Thursday without concrete result, except an agreement to meet again, reports AFP. Syria's UN representative and head of the government delegation in Moscow, Bashar al-Jaafari, told reporters: "We agreed with our Russian friends that discussions will continue in order to hold a (new) consultative meeting in future." 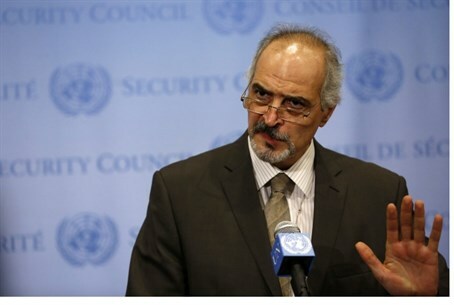 Jaafari said the Syrian government delegation was "positive" about the talks, though there were "no final results because it was an initial, consultative meeting". He blamed the opposition figures who attended the talks for the failure to make a breakthrough. "We did not hear a single unified position from the opposition delegations. What some could agree on, others rejected," he was quoted as having said. The government has agreed to a set of points titled the "Moscow principles", said Jaafari, adding that while some of the opponents present also agreed to the points, others rejected them outright. "We, the government, aim to hold a dialogue conference in Damascus," said Jaafari, adding that such a meeting "would be the last of a series of... meetings." Meanwhile, Soheir Sarmini, a regime-tolerated opponent, said, "The goal of the Moscow meeting was to break the ice between the government and the opposition." Two previous rounds of talks in Geneva also ended without success. The main exiled opposition alliance, the Syrian National Coalition, did not attend the talks, though five of its members were there in a personal capacity, along with members of opposition groups tolerated by the Damascus authorities. The Syrian National Coalition took part in a previous round of talks in Geneva last year, but only after the UN withdrew an invitation for Iran to be part of the talks.